Therefore6 we do not lose heart. In 1954 only eight months after my older brother Bernie was born, my parents received the devastating news that he had Spinal Muscular Atrophy. A little more than two years later, I was born with the same disease and four years following my diagnosis, my sister Tina, the fourth child in a family of seven was also diagnosed with the same illness. Most of the nerve cells that control muscles are located in the spinal cord, which accounts for the word spinal in the name of the disease. 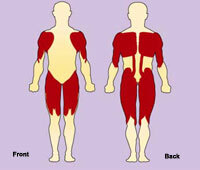 SMA is muscular, because its primary effect is on muscles, which donï¿½t receive signals from these nerve cells. Atrophy is the medical term for wasting or shrinkage, which is what generally happens to muscles when theyï¿½re not active. SMA involves the loss of nerve cells called motor neurons in the spinal cord and is classified as a motor neuron disease. Most cases of SMA are caused by a deficiency of a motor neuron protein called SMN, for survival of motor neurons. This protein, as its name implies, seems to be necessary for normal motor neuron function. Recent evidence suggests that a lack of SMN might also directly affect muscle cells. Children with SMA who are very weak in the early months of life and have breathing, sucking and swallowing difficulties in infancy arenï¿½t likely to have a good prognosis. In the past, it was said that such children werenï¿½t likely to survive more than two years. Today, this is still often true. However, with technology to take the place of natural breathing and eating functions, such children can often survive several years. Mechanical ventilation (todayï¿½s ventilators are portable, in contrast to the "iron lungs" and heavy machinery of former decades) and feeding tubes that go directly into the stomach (not down the throat) can prolong life. Mental and emotional development and sensation are entirely normal in SMA. Many children with SMA can benefit greatly from physical therapy and assistive technology. Though being bedridden for the past several years, by the grace of God, Bernie and I have overcome the odds and live productive and happy lives. In God's all-wise providence, my sister Tina died just before reaching age four from this illness. Please remember my family in your prayers, as we seek to glorify God in our circumstances. The muscles closer to the center of the body (proximal muscles) are usually more affected in spinal muscular atrophy than are the muscles farther from the center (distal muscles). Muscle-controlling nerve cells (motor neurons) are located mostly in the spinal cord. 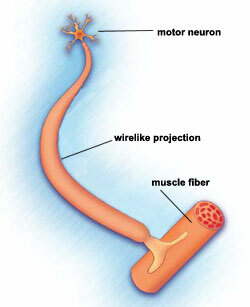 Long, wirelike projections connect the motor neurons to muscles in the limbs and trunk. Normally, signals from the neurons to the muscles cause muscles to contract. In SMA, motor neurons are lost, and muscles canï¿½t function.